A Jeep Wrangler on North Caicos. The main road through Bambarra, Middle Caicos. The transportation options for North Caicos and Middle Caicos at this time are limited to rental cars and jeeps, and taxis. There is no public transport of any kind. Attractions and stores tend to be spread over both islands, so we highly recommend that you rent a vehicle for your stay. Due to the low populations, light traffic, and that fact that the main roads are paved, most will find driving to be easy and stress-free. We do however recommend caution when driving on unpaved and poor quality roads. In many of the low lying areas, flooded potholes on dirt roads may be deeper than they initially appear to be. Navigation on North and Middle Caicos is linear and not difficult, yet due to a lack of signage it can be easy to miss some of the attractions such as Cottage Pond, Flamingo Pond Overlook, and Indian Cave, so you’ll want to have a map. Maps are often provided by the rental agency, but supplies can be limited at times so consider printing your own North Caicos and Middle Caicos maps. The speed limit is 40 mph (64 kph) on highways and 20 mph (32 kph) through settlements. Please drive slowly and carefully when travelling through settlements. At this time, no rental companies offer scooters. Taxis are available, yet can be tardy and expensive. Complementary bicycle use is offered at some hotels and villas. Due to the heat and travel distances, we recommend them as a main means of transportation only to serious enthusiasts. 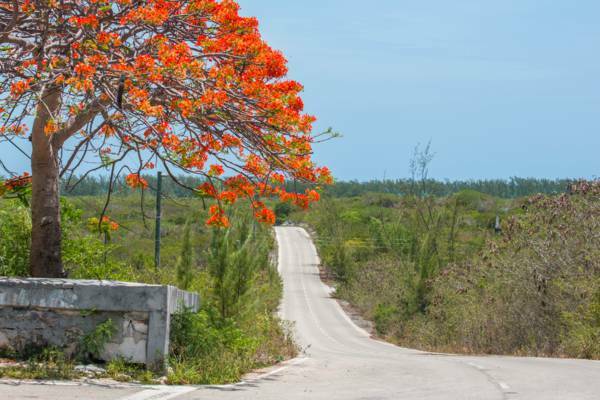 North Caicos and Middle Caicos feature many scenic yet unpaved roads, which can be quite fun to explore. It’s best to have a high clearance vehicle when venturing on some of these routes. Please keep in mind that the environment in the Turks and Caicos is sensitive. Please stay on established roads, and do not drive on the beach, mud flats, or wetlands. The North Caicos and Middle Caicos Causeway in 2011. 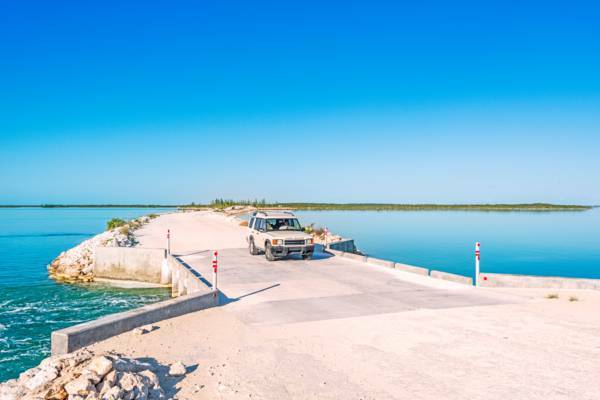 A mile long (1.6 km) causeway connects North Caicos to Middle Caicos. The causeway was built in 2007, yet was heavily damaged in 2008 by Hurricane Hanna, which washed off the asphalt paving in sheets and generally reduced the width to a single rough track. The causeway has since been fully repaired, paved, and is open for traffic. North Caicos has three gas stations: one near the Sandy Point Road and Kew Highway junction, and two in the region of Bottle Creek. Gasoline prices tend to fluctuate and are usually a bit high compared to Providenciales. The current average is about $6.50 a gallon (2018). 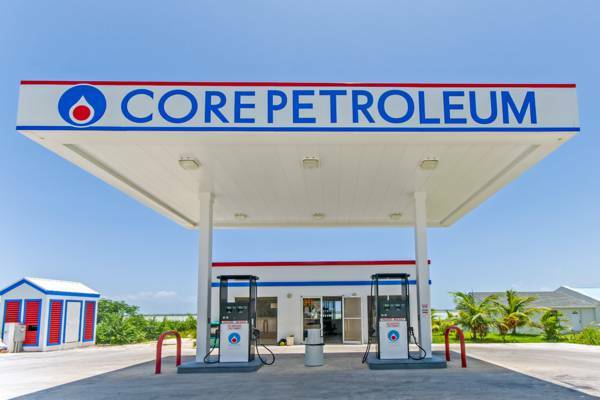 Middle Caicos does not have any regularly-operating gas stations. This gas station in the settlement of Bottle Creek has the spectacular lagoon as a backdrop. Many drivers do not exercise due care and attention, especially operators of taxis (both legal and illegal). Don’t pick up hitch-hikers or provide assistance to other motorists. If you think they need help, call the police on 911. Minimum rental age is usually 21 or 24 (18 for scooters). Valid drivers license required. An International Driving Permit (IDP) is not needed, unless your licence is not in English. A valid passport and credit card may be required. 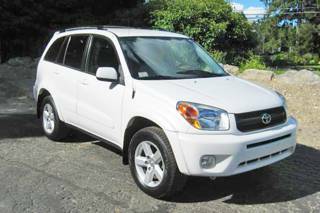 Old Nick’s offers car, SUV, Jeep and pickup truck rentals on North Caicos. Delivery and pickup from Sandy Point Dock or the North Caicos airport available for free. Scooter Bob’s has been offering car, jeep, and scooter rentals in the Turks and Caicos since 1984. 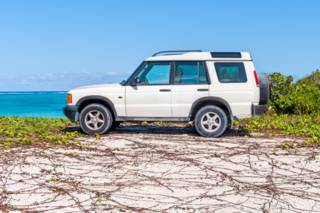 The North Caicos fleet includes modern 4x4 Toyota RAV4 SUVs, which are perfect for exploring the beaches and attractions of North Caicos and Middle Caicos. Agents will meet you directly at the ferry dock for your convenience. Silver A La Car Rental offers a range of well-maintained (with air conditioning!) compacts, SUVs and vans. Drop off and pick up from the North Caicos airport and the marinas is complimentary. 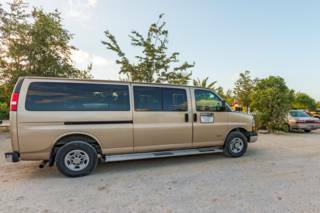 Cardinal Arthur, a Middle Caicos native, offers custom tours of the points of interest on land and water around Middle and North Caicos, along with a regular taxi service. Gardiner’s Taxi offers taxi and island tour services on both North Caicos and Middle Caicos.